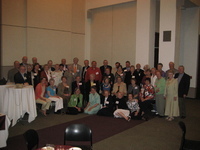 Alumni from the Class of 1959 gather to celebrate their 50th anniversary at the 2009 Half-Century Club events. 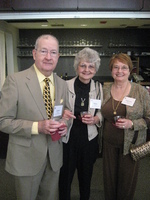 Alumni mingle during the activities for the 2009 meeting of the Half-Century Club. 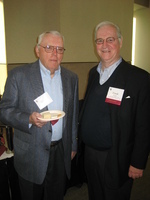 Two alumni at the 2009 Half-Century Club gathering. The invitation for the 2009 Half-Century Club Mass and Brunch, to celebrate the 50th anniversary of the graduation of the Class of 1959. 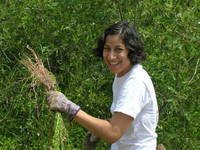 Rebecca Stolz (BA ’06) clearing brush at Ballona Wetlands in Los Angeles during the Loyola National Day of Service on April 19, 2008. 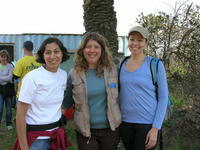 Rebecca Stolz (BA ’06) (left) and Karla Rourke (BA ’02) (right) volunteer at the Ballona Wetlands in Los Angeles during the 2008 National Day of Service. Audrey Skinner (BA ’04) is joined by John Halrez Jr. (BA ’07) and other volunteers at Casa Catalina in the Back of the Yards neighborhood of Chicago during the Loyola National Day of Service on April 19, 2008. 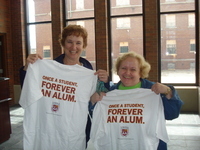 Barbara Weigel (BA ’70) and Mary Franklin (SCPS ’08) help with cleaning and beautification of the Chicago Jesuit Academy campus during the 2008 National Day of Service. 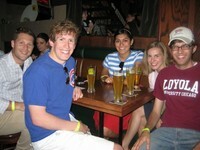 Alumni gathered at Goose Island before the Loyola Night at the Cubs game, June 24, 2008. Loyola alums Samantha Maher Sheahan and Matt Sheahan with their new baby at Loyola Night at the Cubs, June 24, 2008.